I can’t believe my run of luck, simply being in the right place at the right time. I know this is supposed to be a fly tying and fly fishing oriented blog, but yesterday and again today, I can’t help it. 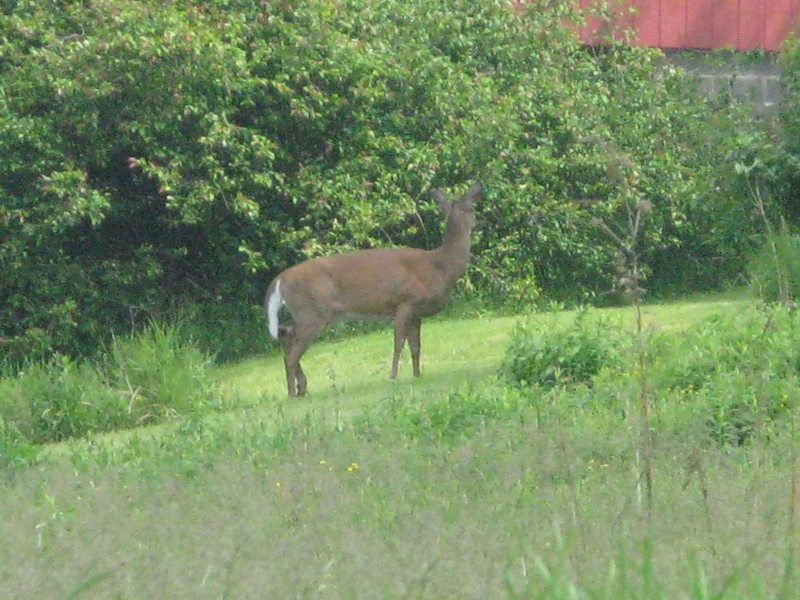 I was sitting at my dining room table, packaging up the boxes for five Carrie Stevens Collector’s Edition Sets, (gotta take care of business), and I looked out the window to see a deer in my neighbor’s yard, about 150 yards away. 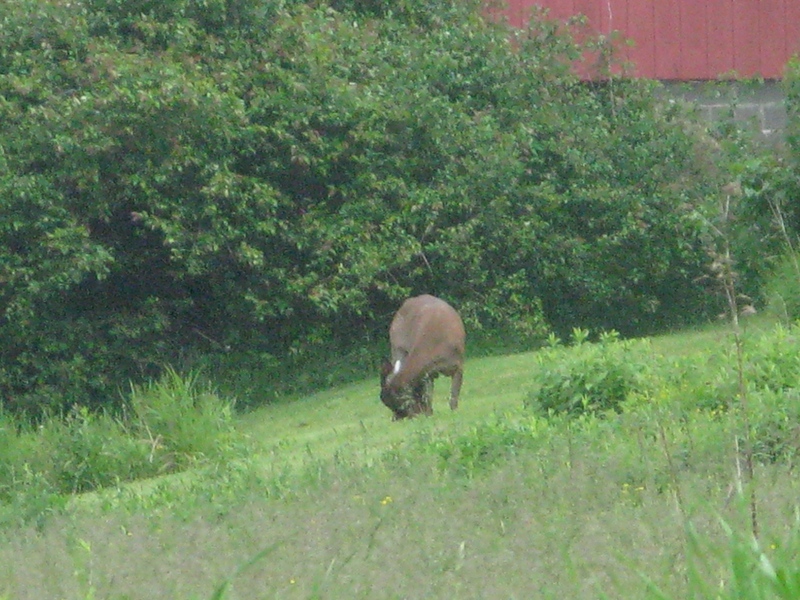 It was a doe, and she was standing, but bent over, and held that position for a couple minutes. I thought, “That’s odd.” As I watched, she raised her head and then I saw it – something was on the ground beneath her – a newborn fawn! Unlike yesterday, where the doe and fawn had merely bedded in my front yard (I just went out and checked for evidence of birth and found none), this doe gave birth on the spot where she stood in Jim’s yard. My neighbor mowed that grass on Memorial Day, so the freshly-clipped lawn provided me with a perfect view. 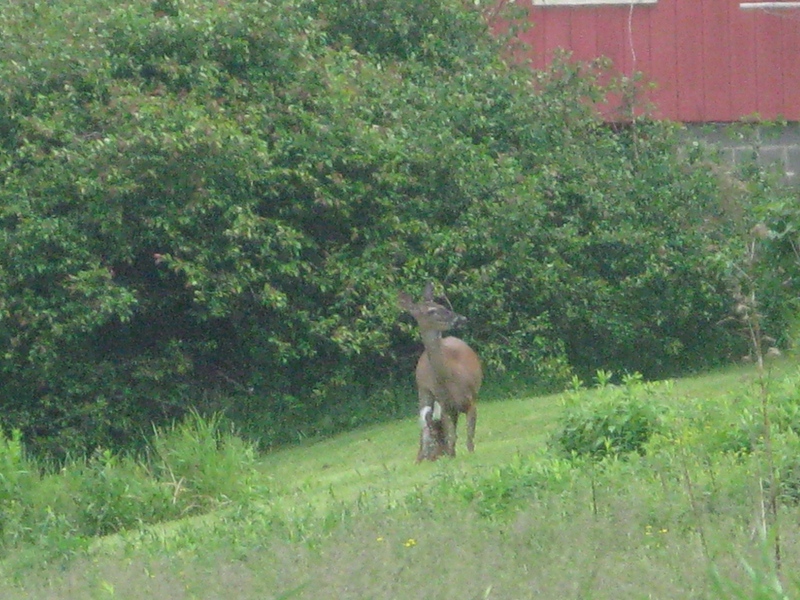 The doe was licking, licking, cleaning off her fawn. In a couple of the photos, the fawn appears almost black; I suppose that’s the mixture of blood and fluids coating the fawn at birth after exiting its mother’s womb. I grabbed my camera, and rested it on the patio railing, but even then, zoomed out to 24x magnification, the camera still trembled from the touch of my finger on the shutter button. Even at a shutter speed of 1/640, I still wanted to eliminate camera shake. I said to myself, “I gotta get the tripod.” Then I remembered that I had an extra tripod on the patio, right beside the door. It was leftover from a yard sale last summer. I got it for free, figuring I could use an extra tripod. So I hastily set up the tripod, mounted the camera, set the custom timer, and took these photos. The doe appears attentive to something across St. Michael’s Road. 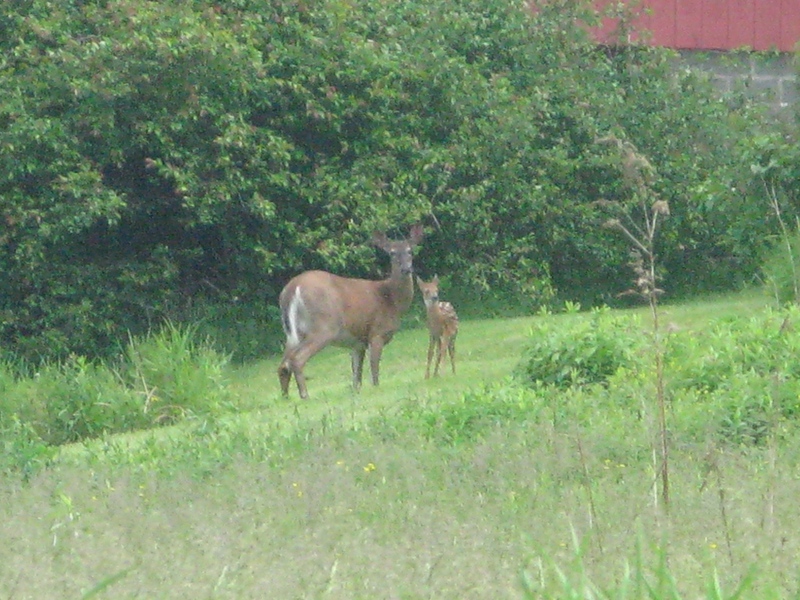 She gave birth to the fawn right on mowed grass in my neighbor’s yard, barely forty feet from the paved road. The doe is licking and cleaning the fawn. The appears to be sitting on its hindquarters with its nose pointed up into the air. Notice how dark (wet) it is. After several minutes, a car came up the road, traveling north on St. Michael’s Road. The vegetation along the road and my neighbor’s barn acted as a sound-proof barrier, screening its approach. When the car passed the barn and the doe at about forty feet, the sudden sound of the car startled doe and she wheeled about one-hundred eighty degrees. She knocked the fawn over in the process. The fawn is out of sight, but lying in a slight depression in the yard. 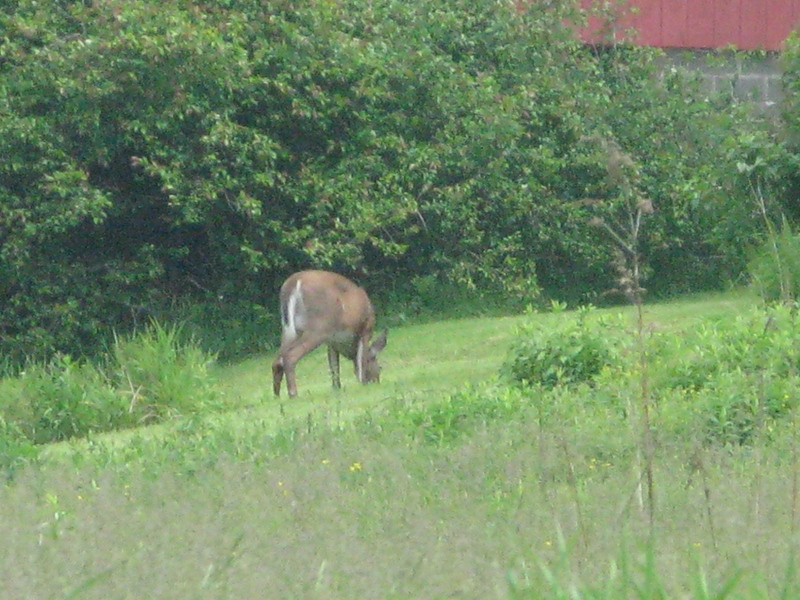 She struck the fawn so quickly with her hind hooves that I was concerned she may have knocked it out, or worse. 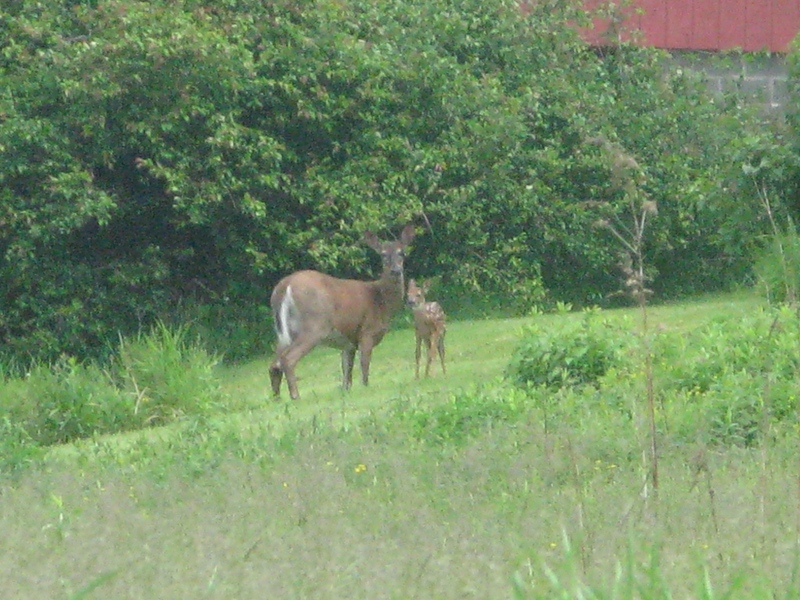 After the alarm of a passing car, the doe is checking on her youngster. The fawn stood up, apparently unscathed. The doe saw my movements on the patio and was checking me out. One last look and a pause; five minutes later they were gone. Another good day! I suppose next I’ll be seeing a wild turkey with poults, or maybe even a black bear sow with cubs. This entry was posted in Fish Stories and Other Tales and tagged White-tailed deer and fawn. Hey Don, you’ve got quite an active yard! Yeah, been busy the last two days. BTW, been doing real good on my “Floating Caddis Energer” 😉 ,tied in a #14 with a ginger “sulphur” nymph-colored body, fished in a tandem dry fly rig during sulphur hatches. About 1/3 of the browns on Spring Creek I’ve caught have fallen victim to that pattern variation. Thanks for your comment! Another cool story. I would not want to be seeing any black bears with cubs though. That would scare me…lol. Those are some cool photos of the fawn and doe…they are beautiful creatures! I had a whole herd in my yard this past winter…well there were six…I guess you could call it a herd! 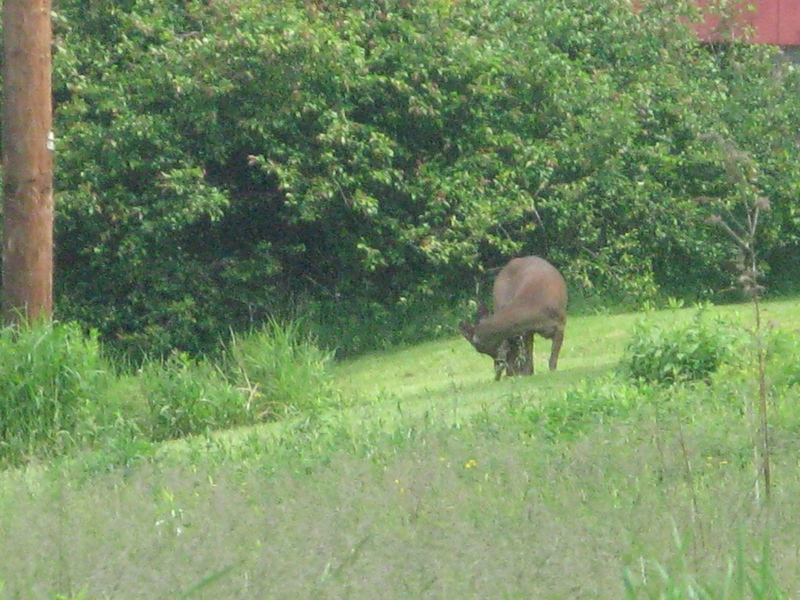 I saw a doe this morning in the yard too…I think she was gettin ready to give birth also. She was heading to the same spot that a little skipper came out last year and watched me while I was mowing on the tractor for a second, then ran back into the woods. Glad you liked the photos Dave! Stories about deer and other wild animals are always interesting to me. I know there are others out there like me with that interest. Thanks for sharing a bit of your deer stories! Always a pleasure to have an opportunity to watch wildlife. Thanks for your comment!